EDIT:What's with the negative rating here? Honesty not rewarded? Tried to be concise and say it as it is here. Please, point out the falsehood... OP said new guitar, take it back. If Sweetwater distributes this guitar with all the "extra" care they put into shipping, and they miss this? Honestly, no grooves in saddles, your strings slip. You'd notice this on the first string bend. The best advice I gave was that they should be there, return your faulty new guitar... Ask yourself, would you want to keep a Gibson with no slots on the bridge? Oh, I get it, it must be the Bitterwater comment. If that triggers people here, then I'm in the wrong place. Yeah, somebody missed that, well actually two "some bodies". I received a replacement ABR-1 bridge with two posts direct from Gibson and the notches were done. 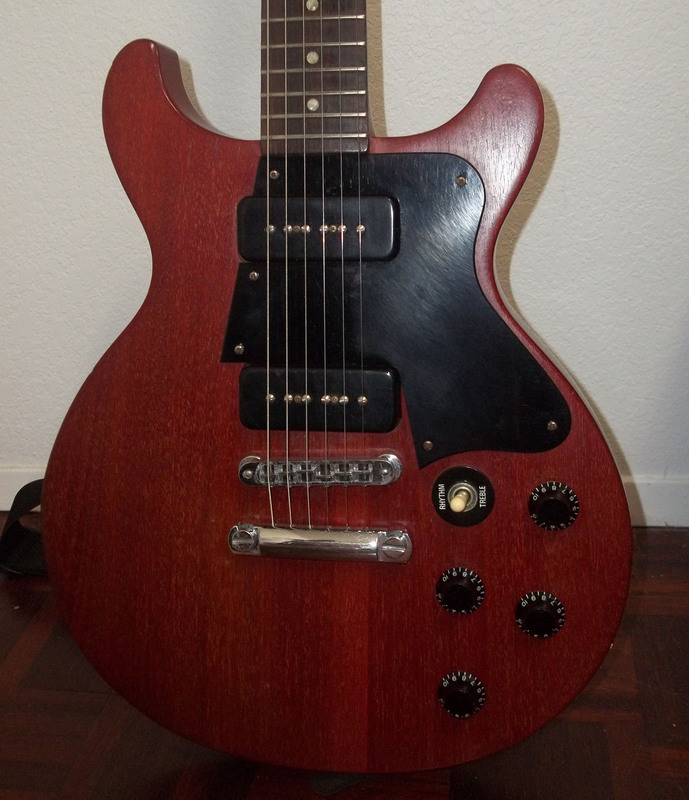 It is not unusual for some Gibson models with P90's bridge saddles to not have notches. P90 string/pole spacing is not as exact as with humbuckers. Standard Gibson P90 pole spacing on bridge and neck pickups in many cases is the same requiring you to find the best string position on the bridge to straddle the poles.. This is one of the reasons why you can buy TOM bridges without notches..... Like my Faded LP Special DC below.. I've owned plenty of new Gibsons that had no notches in the saddles. String needs to find it's spot, it'll wear a notch pretty quick. Sure, they can slip, but overall not a crisis. Thanks for the clarification. I stand corrected because I have never handled a guitar that did not have slots on the saddles. I always thought that TOM bridges with no slots were for someone else to file slots into and manually radius - which I have seen StewMac guys sell tools for. Not that I have ever had any interest myself in filing or radiusing a TOM bridge. And appreciate the education if this be the case. I'm not going to argue with the facts. I don't spend time on this forum to waste my time or anyone else's time - and I especially don't like to contribute garbage. I believed that I was giving sound advice to someone to return a guitar. Either that, or instead of running to the forums as first resort for information, web search or call a sales representative. I simply don't like to ask questions to a forum that can be easily answered by simple web resourcefulness. But hey, no harm in asking I suppose. Ahh, who knows these days... You get your head chewed off for the stupidest crap and it puts some - like me - almost on the defensive immediately. I know I have gotten some crap here I didn't deserve. Also received some good thoughts and such from plenty here, but damn, irrationality has no bounds with some people... Good luck to you I say. I never claimed to have the best content here, but I don't think I am making the place stink up... I just don't like to take people's S###. No big deal, I have seen a lot of your posts in here referencing very valuable good information and I would have to say " please don't stop" or feel any apprehension about posting what you believe to be valid. This is a learning experience, I get corrected all the time. Post some pictures. I'd like to see it. If it left the factory without notched saddles that's an error, IMO. Based on other comments, I won't doubt that it's happened. But, I doubt it was Gibson's intent. BTW, I've always felt that the 27,000 point inspections were a joke. These companies have to deal in volume to survive. They don't have highly skilled technicians doing a full setup on each and every guitar. I bet they pick it up, make sure it doesn't have any glaring flaws and they send it out. Sorry for the negativity, but that's what I think. Interesting. You learn something new every day. I had no idea the ABR1 shipped without notches on completed SGs . All my SGs and LPs came with notches. Even my 2017/2018 Gary Clark Jr w/P90's came with notches. 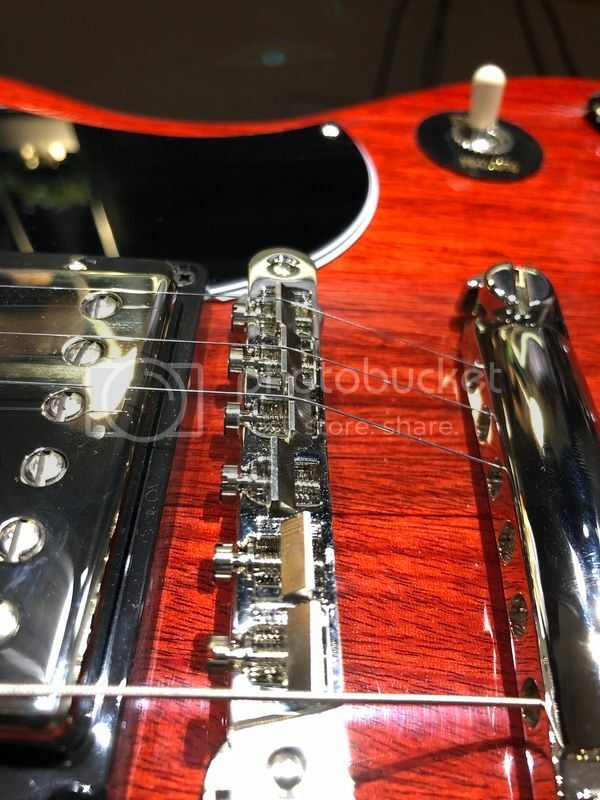 Curios, I'd like to hear from other 2019 SG Standard '61 owners and see if their bridge came with or without notches. Nothing is absolute, no telling what the assemblers had on the shelf in front of them when they put the guitar together .. I come from a time before notches when you had to check your string position on occasion, no notch doesn't hurt anything, may even resonate better. But like RCT said, the strings will create their own notches. Image from stewmac a 50s style original ABR1..
Yeah, I've seen both, with and without notches being sold separately, just not on anything assembled as a finished product. I had assumed the one without notches, from both Gibson and Stewmac, were so you could put the grooves in yourself or by a qualified tech. 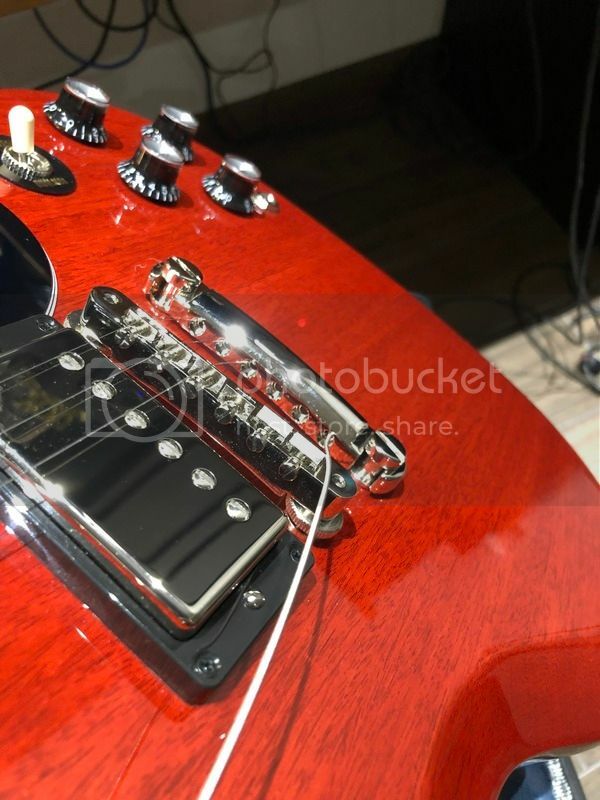 I have seen them both ways on new Gibsons, originally the first ABR1's had no grooves, later as strings got out of position and creating multiple grooves people started putting in a notch in the correct position.. anyway notched or no notch they are still ABR1's. "BTW, I've always felt that the 27,000 point inspections were a joke. These companies have to deal in volume to survive. They don't have highly skilled technicians doing a full setup on each and every guitar. I bet they pick it up, make sure it doesn't have any glaring flaws and they send it out. Sorry for the negativity, but that's what I think." I haven't been to their warehouse to actually see what the do with each guitar - but I have bought 2 guitars from Sweetwater and both arrived very well set-up, even pretty much in tune, and never a finish flaw or other problem. They do have qualified technicians who can do some complicated repairs so I tend to think that their claim of an inspection on anything over $300 is valid. Can't vouch for any other sellers, but my experience with them has been great. These days they just take and align the strings and pop each string on the saddle with a hammer and it creates an area the string will kind of rest in. Not really a notched grove but over time it will start wearing into the saddle more. Looks like they need to make it a 56 point inspection. Yeah I don’t know what I’m talking about then. I have never bought a TOM a la crate and I really don’t know what it takes to get one squared away. All I know is that strings shouldn’t be sliding off of them when you’re playing. I have seen the stewmac video where they take a hammer to the saddle with a string in it to make an initial groove... maybe someone forgot to do that to the SG in question. Would be interested to know what Sweetwater says about it though... and perhaps Gibson or someone else who bought this same guitar. I didn't mean you don't need to file grooves, they're just not to any fretboard radius. TOM arch does that. Understood. Yeah come to think of it, if you bought an a la carte TOM bridge and it wasn't arched, you'd be doing a lot of filing and such to get the radius of the fretboard matched... It would be messy and just doesn't seem like you'd do this intuitively. I know I have seen TOM bridges with no slots. Filing (or hammering a string over the saddle per the StewMac video I saw) will be necessary. But getting back to the OP's stuff here... are these SG's supposed to come with no grooves as in the shared image? That seems silly to me and too much room for a string to settle in some position where the string spacings are all over the place. Maybe someone at Gibson forgot to hammer the slots in if that's what they do - again what the StewMac video claims they do to slot their bridges? All I know is I personally would not prefer to have a guitar that does not have the grooves properly set on the bridge for the money I'd pay for a Gibson. BTW, that's a nice looking SG though - just needs some slots on the bridge IMO.